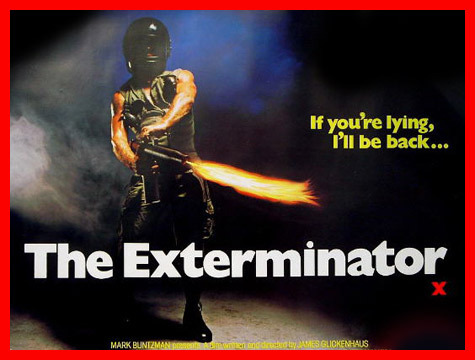 Holy cannoli, you can watch 1980’s THE EXTERMINATOR on your computer any time you want to thanks to HULU. I swear I do not own stock in HULU, it’s just that I come from a wretched time period where you had to wait a year to watch THE WIZARD OF OZ on TV. Anyway, THE EXTERMINATOR is broncho nuts. I think if I was forced to make a top ten list of the most traumatizing movies of my youth, it would certainly be on it. Once upon a time I tried to write a traumafession about it HERE but I don’t think I’ll ever be able to properly put my feelings into words. The weird thing is, THE EXTERMINATOR does not get less insane with age, it just seems to get more and more crazy and explosively sinister. Check it out below and say so long to your mental well being….